Established for more than half a century, Singapore Polytechnic is known as the oldest polytechnic in Singapore. But with newer institutions sprouting out, the school recognized that people needed a more refreshed representation to better showcase the real-life wonder and moments that polytechnic students experience in the world. 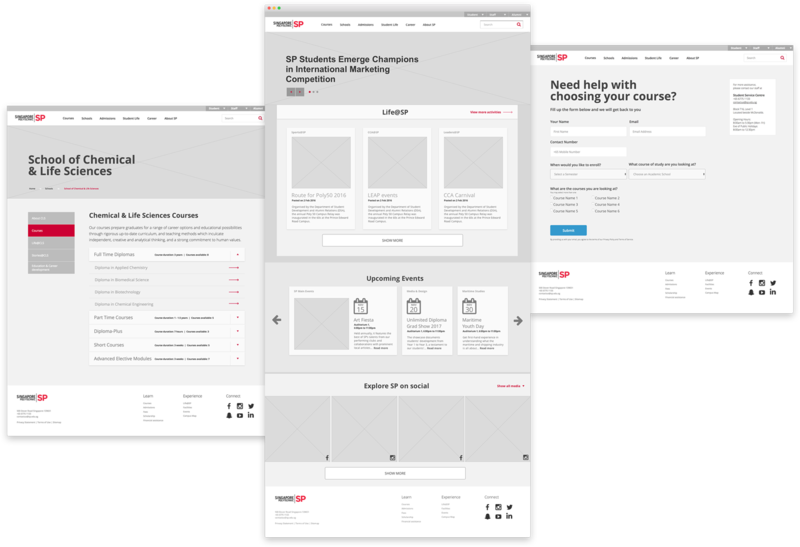 Appealing to prospective and current students alike, the strategy was to redesign the information architecture of www.sp.edu.sg – to simplify information flow on the website and to increase credibility of the school. To identify some of the key issues, we spoke to user groups made up of prospective and current students. We also conducted cards sorting and usability testing with them to have a better comprehension of the site’s usability problems. Through these conversations, we learned that users had a hard time finding the information they were looking for on the website, and many potential students felt insecure about what the school can do for them because of that. With insights from the interviews, a new strategy and information architecture was developed to serve all kinds of users. Content relevant to the students are made easily accessible through the homepage. It is recommended that the platform provide a feature which enable students to request for advice to choose between courses. With its usability and strong campus community presence, the new SP.edu.sg gives students just what they need as they continue to develop in their education.